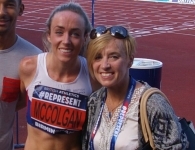 Coach-athlete partnerships don’t come much better than this…Liz and Eilish McColgan have one of the greatest sporting partnership in history – mother and daughter. Liz McColgan is herself a former World Champion, Olympic Silver Medallist, Commonwealth Gold medallist and all round endurance running legend. Famous for making a quick return to competing after giving birth to Eilish in 1990 and winning a bronze medal at the 1991 World Cross Country Championships, Liz has a long list of accomplishments in events ranging from 3,000m, 10,000m and marathons. She has been coaching since 1992 and now resides in Doha one of the lead coaches at the Doha Athletics Club. On top of her running achievements, her accolades include BBC Sports Personality of the year, an MBE and was inducted into the Scottish Sports Hall of Fame in 2004. She is now the only female coach in the UK to have an athlete qualify for the British Team at this years World Championships in London…and that athlete is her daughter Eilish. Eilish is in her own right a world class athlete having had her best season so far with a host of PB’s, a European Indoor Bronze medal and recently qualified for her home Championships in London. She has been to two Olympic Games (2012 and 2016) for two different events (3,000m steeple and the 5,000m flat) and aiming for a third in Tokyo 2020. Eilish has always been coached by her mum Liz since day 1. Congratulations to you both for the performance at the British Trials - Eilish how does it feel to have qualified for the World Championships, especially when not long ago you had a hamstring tear and Liz how did it feel watching Eilish cross the line? EILISH: It was frustrating for me! I had a really bad race in Rome a couple of weeks ago in which I had a little bit a niggle which I didn’t really think about too much at the time. I didn’t finish that race unfortunately because of it and then 2 days after that when I tried to run I ended up tearing my hamstring! It was such an unfortunate time for it to have happened so close to the trials. Any other time of the year it would have been OK, 3 to 4 weeks and I would have been back full training again, but unfortunately this was 2 weeks before the British Trials [for the World Championships] it couldn’t have been any worse timing! I was so disappointed at the time, we took the decision to not compete so we sent in our letter to UKA saying that we weren’t going to be at trails. I had an MRI scan and saw the Doctor etc and UKA agreed that it was OK to miss and granted me a medical exemption. The problem was however that even with the medical exemption, you still aren’t guaranteed to be selected for the team. Laura Muir already had a medical exemption, so I knew she would get the third discretionary spot on the team [each team can only pick 3 athlete per event for the Word Championships] so that meant that the only 2 other athletes to be chosen were the two athletes who were to finish in the top two at the Trials – so it was such a tough situation to be in. We waited up until the Thursday before the trials that weekend to make the decision. It all worked out though in the end and I managed to secure my pace in the team [as Eilish came second in the trials]. It could have been a different outcome if the trials had been a day or so earlier! LIZ: The trials this year were very different to other years because although she has had injuries before, they have always been OK by the time the trials came around. What happened in the lead up was that she competed in Rome and whenever she gets periods she always gets tight hamstrings so she had a tight hamstring going into the Rome race. After about 4 or 5 laps, one of the girls behind her kept clipping her spike plate on her shoe [the bottom of her shoe when she was ‘pulling her leg through’ during the recovery phase of a run technique], so it was a bumpy run which continued for over a mile. In the end her hamstring just tightened up too much and she had to stop the race. She then didn’t get an opportunity to cool down properly because of drug testing and then hours later at 6:30am was on a flight back home. So when she ran for the first time, her hamstring tore and she had a grade 3 10cm tear – 2 weeks before the trials! Which was an nightmare! Luckily she got a lot of good care from the Physio that she works with, Chris, and the Doctor at UKA. She had the weeks off in the lead up, so we actually went into the trials hoping she would just get through! As there was only her, Laura Muir and one other that had already achieved the qualification times in her even, we had hoped that she would have been preselected anyway, but that didn’t happen so we had no choice but to actually race on the day of the trials. Right up until the day before, we weren’t going to race because the hamstring was problematic, it wasn’t until an hour before the race she warmed up and decided to do it. The only reason I let her race was because we had decided that she wouldn’t be ‘sprinting’ – we went into the race knowing that 4 laps out, she would need to put in some consistent laps to break up the field and ensure she got second place. It was pointless trying to go for first place because we knew Steph [Steph Twell, a fellow 5,000m runner] was in good shape and we didn’t want to risk the hamstring by trying to sprint against her for the finish. So the whole plan was to run for second place and not let anything happen to the hamstring. She completed the race exactly the way we wanted her to do it and luckily for her she came through and qualified. She did it in style and the way that I wanted her to. At any time during that race, her hamstring could have gone again and that was the worry. So for me, it was probably the worst race I have ever had to watch, knowing there was such a problem with her hamstring. But she came out of it not any worse than when she went into the race so its still healing and I would say the next race or so she will be able to get sprinting again and getting back to her own pace. So we have been luckily that she got through, qualified for the team and I can chill out now and just get her back into her training. Eilish, with all of this going on and having no choice but to compete with an injury, what goes through your head when you are stood on the start line waiting for the gun to go? EILISH: If I’m totally honest it was probably the least nervous I have ever been for a race. I felt like there was nothing I could do – if my leg got tight and sore and went again, what could I do?! But I didn’t want to leave it down to the selectors and have the decision out of my hands, I wanted to show that I had done all that I can, so because of that, I actually wasn’t nervous at all! I just controlled the things I could control and that was that. The leg was sore warming up, it almost took my mind off the race, I wasn’t focussed on running, I was focussed on getting the leg through the race without any set backs! So there wasn’t any real negativity or panic about the World Champs, the focus was just about finishing the race and trying to get within the top 2. It was strange going into a race and not having to worry about winning it, I just wanted to get within the top two and secure my spot! Liz, from a coaches point of view, what to you say to an athlete who has had a great season, but then had an injury that bad two weeks before such an important race? How do you help them in staying positive and dealing with any worry pre race? LIZ: It’s really difficult, because the injury wasn’t caused by training per say and she has just been a very unlucky athlete. A lot of people think she has been injury prone – but she’s not, she has just had a lot of bad luck! From the information that we were getting form the medics and the way in which her leg was responding, for me it was just to say to her “worst case scenario, you don’t run in the race, at least you have the rest of the season.” It was very very important for her to be at the London Championships, another home games – she would have been very very upset if she hadn’t have been selected! It’s about weighing up what the athletes needs are and what the coach believes the athlete is capable of doing. Because of the standard of athlete she is, I was positive that she would get second in the race, so I didn’t think that was too high a risk. The only thing I had to work out was if her head was in the right place, she hadn’t ran for two weeks prior to the trials, so we were relying on all the background work she had done prior, including everything at altitude, to carry her through. It’s very difficult for a coach to keep an athlete positive and not let them worry about a lack of fitness etc. I was just very honest with her and reminded her that she has a huge ability and belief in herself and she has the ability to make the team. My job was just to stay positive and tell her that her hamstring will be OK, which is difficult when I was 100% sure! You just have to do everything you can to make it a positive experience for her as an athlete, take the negativity away and hope she can get through it. Eilish, from what you learned about yourself on Sunday and the lessons you have taken away from it, what advice would you give your own athletes who you coach through your online coaching business in how to deal with a similar situation to yours? EILISH: I would remind them that all the hard work has all been done previously. I knew that I was in PB she and the best shape I had ever been in, so I think to remind them to have confidence in the training they have done…they have worked hard for months and months so when it comes down to that one race all the work has been done. My experience of having to have 2 weeks off before hand was not great preparation, but at the same time, 2 weeks is not a huge amount of time. I had put in enough work over the season to get me around and into that top 2. So you have to remember to have the confidence in the work that you have already put in. Liz, do you as Eilish’s mother find it difficult to make certain coaching decisions for her? Does the mother side of you say one thing and the coach says another? LIZ: That is the hardest thing…if I had my mothers hat on this weekend I’d have told her not to run, just forget about it, its not worth putting yourself through all the pressure. But as a coach, you know how much it means to your athlete and you know your athletes limitations and abilities and I know Eilish can be very strong willed when she competes. So I have to weigh up the mothering feelings and the coaching feelings and separate them. As a coach, you can’t let emotion get involved because as a mother you do get emotional, you have to hold that back and not let your athletes / daughter or son see that you are concerned with the outcome. Just before the race I spoke to her boyfriend Michael and asked him if he thought if she would compete if she didn’t believe that she was strong enough to do this… and he said no definitely not. As soon as he said that I was happy with my decision to let her race. You always worry about where their head is because this is about much more than just physical ability. There is a lot of pressure on the athlete wanting to make a team and get it right on that one day. The rules of the trials are the first 2 through with the time to get selected, with a third spot decided in perhaps other ways such as discretionary selection (i.e. if injured during the trials or they want to compete somewhere else such as a Diamond League), whereas in the US, if you have to come top 3 on that specific day, or thats you out of the team. And what are your thoughts on the differences in selection policies? LIZ: All I would say is I wish that selection for everybody was the same. There were people pre-selected for the British team that didn’t even turn up to the trials, where as someone like Eilish is pressurised into running with an injury to make the team. We didn’t want to leave it down to the selectors to decide she wasn’t good enough because she missed the trials. It would be better if the policy was more transparent and not leave us all guessing. A lot of other people also had niggles and injuries who had to gamble as well – I don’t know if they got through or not, but it is such a difficult situation for an athlete and a coach when you have to try and decide this for a big championship. For me its always a fine line, some people’s faces fit more than others and there is a fine line on being selected or not…there is a criteria there, and if that is met then. I do think if Eilish hadn’t have run this weekend, I’d be worried if she had been selected or not because of past problems she has had. So that is why we felt the pressure to compete, we can’t just leave it to the selectors, so thats were it becomes very difficult for an athlete who has to put everything on the line. It is very very difficult to have a guideline or selection policy that suits all. The American’s just do first 3 whether you are there or not, tough! That is harsh, so I do think the UKA policy for selection is a bit better because there is a little window for people that aren’t right on the day – because at the end of the day you want to make sure you have the best team there but it has to be fair and transparent and thats the problem, it isn’t as transparent as it should be. Liz, I’m not sure if you heard it or have seen it since, but Darren Campbell was quoted on Radio 5 live at the weekend saying: "The people running athletics in Britain are killing the sport, they are not thinking about the volunteers, they are not thinking about the people that give their time to the sport. They are not thinking about the fans and they are not actually thinking about the athletes.” I know you and Eilish have had your difficulties along the way with the sports administration side of things... so would you agree with Darren? And how could the governing body support coaches and athlete more to improve the sport? LIZ: I think Darren was talking more about the empty stadiums rather than the treatment of the athletes, talking about how people within UKA aren’t doing enough to promote athletics in the right light so a lot of the fans are leaving. It was sad to see the trials so empty. As far as Eilish is concerned however, she would never have made that start line if it wasn’t for one of the Doctors at UKA. He really went out and helped her along with one of the physios at UKA – so she does get the support she needed. But then again its not the smartest idea to race on a hamstring when you have a tear on it. So you are in a catch 22 situation. What I would say about UKA is the marketing could be done a lot better, athletics is a fantastic sport to watch. If anybody had been a the trials, they would have seen it was probably one of the best trials we have ever had with such competitive races in the 1500, 800m, 200m and long jumps…there was some fantastic and exciting finals. Any spectator surely would enjoy watching that level of competition, but it begs the question why were the seats empty? Why aren’t we getting the crowds in? What I would say to that is that a lot of our big stars weren’t there and when you have a sport as small as our athletics is and you are trying to get kids involved and people to watch, we really do need all our funded athletes there, and a lot of them weren’t, so I would say that the only negative. If Mo Farah would have turned up, the stadium would have been full. How can British Athletics tie down these people for trial day? They don’t have to run their main distance – so for example, Mo could have run a 1500m which would have been a good race. There has to be some sort of policy brought in where the top athletes don’t miss the trials through choice. Different if they have a medical reason, but through choice shouldn’t be allowed. We need bums on seats! In my day the stadium was always packed! This weekends trials was brilliant, one of my favourites was the women’s 400m, so competitive. The person who has been the best all year didn’t win it so its that kind of competitiveness that we need! The public enjoy that and its great to watch – it is such an exciting sport when its at that level. The marketing and promotion needs to be reviewed – and having all of our stars there is the number one thing. Eilish, how excited are to be performing at the London stadium again? EILISH: For me it’s like the end of a full circle…my first major championships was the London 2012 Olympic Games so to go into that as my first one was such a huge step up in competition for me. It was SO nerve wracking and I was so under experienced. I didn’t perform the way I wanted, so it will be nice to go back to the stadium now with 5 years experience behind me and a lot more confidence. I will be competing in a different event this time [from the 3,000m steeple chase to now the 5,000m] but I feel a lot more mature and older and wiser with regards to my performance. I feel I can go in there and compete the best I can, it’s so exciting to have another home games. I have been so fortunate to have had the London olympic games, Glasgow Commonwealth Games etc. If 2017 London Games can live up to even 70% of what 2012 London Games were it will be an amazing time! Liz, did you know that you are the only female coach to have an athlete qualify for the Worlds at the trials and along with Kelly Sotherton, the only female coach with an athlete in the top 10 in the UK…Eilish how proud are you that your mum has achieved this and Liz, what do you think this says about the state of athletics coaching in the UK? EILISH: I didn’t realise that actually, I thought there may be a few others in there – but it is amazing for my mum to have achieved that. She is obviously not just a remarkable athlete herself, but what she has done for me coach wise has been brilliant. I know that over the years people have questioned her and thought that I should have moved on and got a new coach, but I am still improving every single year, so why make changes when things are going right and I am still able to make progress? When it comes to the point when you stop improving, thats when you make changes, but when things are going well why change? I am really proud of my mum and everything she has achieved. She works so hard – I very rarely see her now to be honest, but having her there on the day supporting me was amazing. LIZ: It’s mad isn’t it! There are a lot of women out there doing great jobs and involved at grass root levels, go to any club and there are plenty of female coaches. But we definitely don’t get the same opportunities within the coaching profession. It’s very hard to get that anyway, but as a woman it’s even harder. It’s not just because myself and Kelly were good athletes that make us good coaches, I’ve been coaching since 1992 and didn’t retire until 1996, so I was coaching well before I retired from running. I have spent a long time coaching and got a lot of experience and spent time with a lot of other coaches and learned from them. Being at the level of coaching myself and Kelly are at, is all about the time we put in and obviously we’ve been very lucky having athletes who are at a good standard and able to compete on a world level. It’s a very difficult pathway and I still feel that most of coach networking is done at the bar at night in the hotel which isn’t always suited to women – a lot more could be done by making women coaching conferences and get coaches like myself more involved. There is always a lot more that could be done. At the end of the day as a coach whether you are a woman or a man you have to build your group up and hopefully you get that one gem that you can break through to GB standard. I don’t think Kelly has been coaching that long as she has not long retired herself and her athlete was already competing at the top level, so Kelly is still a development coach as well. Its good that me and Kelly at least have athletes on the team, but so much more can be done in the mentoring and support of us all. Women can be very good coaches at a different level simply because we have different approaches to male coaches – we don’t all have to be out there shouting and being so vocal. Coaching on all levels is very difficult to get to the top, but as a woman its doubly hard because there are less women involved to chose form the pool. I think there is a lot changing, but there still needs more to be done. The fact that you have the Female Coaching Network which has started and the following is growing – having different women from different sports doing interviews and talks is so important. Sharing knowledge is the bet way forward and the more woman that can come forward and be seen coaching the more girls will get involved in sport. It’s about making athletics available to young girls to coach as well, just getting involved in the sport. Even as officials, its difficult to get the young involved in officiating…so getting young girls to commit to coaching is very difficult. If women have children as well, this is very difficult to commit to weekends etc because of child care – being a full time coach is almost impossible. This makes even applying for job opportunities difficult too for women too. LIZ: Its like a colouring book isn’t it, they have a picture put in front of them that they all colour in and think OK, thats done…but they don’t understand that there are another 59 pages in the book that need colouring in too! Just because you colour in one page doesn’t mean to say that the job is done! You will always get people coming up with bright ideas, but they don’t understand it fully. I thought the women’s coaching group at UKA was brilliant, I even spoke at the inaugural conference in 2009 at Crystal Palace, but if the governing body won’t continue it’s support with funding etc, where else do female coaches get the pathway and the learning opportunities from? We have a lot of old coaches that were really good in the 1980’s and 90’s and they are all getting older…they will pass over and all that knowledge is just going to be wasted! Why aren’t there classes or groups where people can ask questions – not lectures, but Q&A’s. We need to learn from these coaches and this is also what women need. We are all about trying to get more women into sport, but if you don’t give them the opportunities to learn and be with like minded people, how can you progress in the sport. At grassroots level we have lots of parents involved with that who end up getting involved in low level coaching because their kids are joining in – but we need those at the next step. When we get the 15, 16 and 17 year olds starting to run well, there is no development path for coaches to actually progress along with the athletes. For women its even harder to find this. And this is why the set up at UKA with the Women’s Coaching Advisory Group was so good, but for it to be folded already is ridiculous. a centre of excellence, we are all over the country and everybody deserves the opportunity to develop themselves as coaches. We don’t have enough pathways to do that at the moment. Which is more nerve-wracking for you Liz; being an athlete or a coach? LIZ: A coach, definitely. I can’t control the situation the athlete is in, but as an athlete I am in total control. When I used to race, I was very controlled with my nerves, as a coach, I can’t control that for my athlete.